Are you a community-based organisation with an innovative idea? Do you need to gain exposure and funding to make your idea a reality? 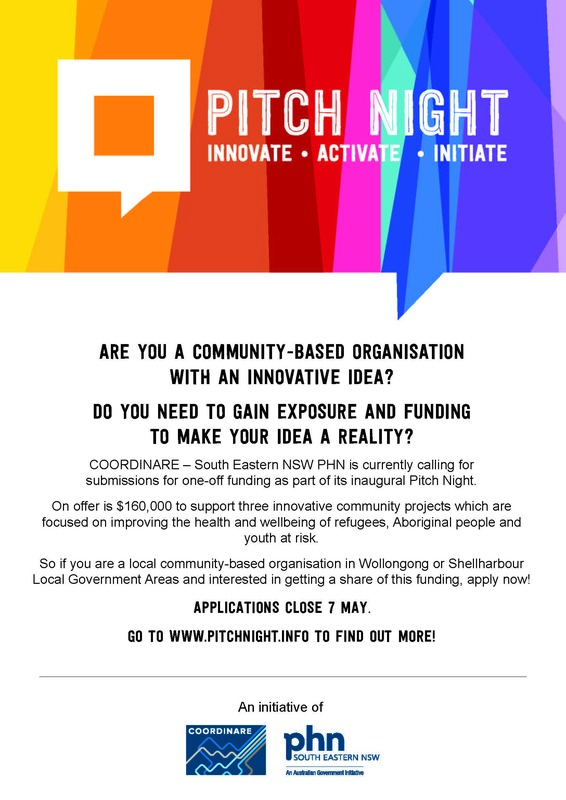 Coordinate - South Eastern NSW PHN is currently calling for submissions for one-off funding as part of its inaugural Pitch Night. On offer $160,000 to support three innovative community projects which are focused on improving the health and wellbeing of refugees, Aboriginal people and youth at risk. So if you are a local community-based organisation in Wollongong or Shellharbour Local Government Areas and interested in getting a share of this funding, apply now! Applications close 7 May 2019.